If you’re a DIYer or home theater enthusiast, you’re probably always drooling over the latest and greatest gear. I’m right there with you. I get to play with some of the best toys there are and I still want more. This is especially true when it comes to measuring. I’ll admit it, I’m a measurement junkie. I want to know how hot it is, how loud it is, and how well my equipment performs. It’s a true passion of mine. Sometimes though, there’s a limit to what your checking account can handle. Sometimes you have to make choices. When it comes to RF signals, the sort of signals that are used for everything from antennas to cell phones to satellite, one big choice is between a meter and a spectrum analyzer. It’s not just a matter of cost, it’s a matter of needs. They’re similar, but not the same. Let’s look. At its simplest, a signal meter is just a way to see if there’s any sort of signal on a line. With a really simple meter you don’t even know what kind of signal it is. This is the sort of meter you’d use for a quick aim of an old-school satellite dish or TV antenna. All you need to know is the signal’s strength. A more complex meter like this DIRECTV AIM will tell you a lot more. It will give you not only the signal strength but also the kind of signal you’re reading. Very expensive meters blur the line between meter and spectrum analyzer. When you talk about a spectrum analyzer you’re usually talking about a lot of money. It’s recently become really popular to build them into handheld enclosures, but in the past the spectrum analyzer was strictly a lab-bound instrument. With a spectrum analyzer you can look at signals across a really wide range of frequencies. A typical spectrum analyzer can show you what’s going on from 30MHz all the way to 3,000 MHz. Some go up into the gigahertz range. They typically show you a graph of where the signals are strongest. This is useful for determining interference patters and figuring out how to aim a “wideband” antenna like a UHF/VHF antenna that has to perform really well all the time. It can also help you isolate the things that generate noise on a line. It’s really useful to see that graph of frequencies but imagine if you got a display like this one. 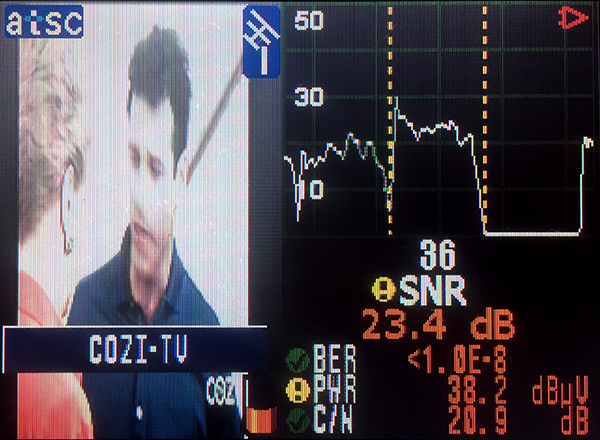 You can see what’s actually being broadcast, plus the characteristics of the signal and the most important signal measurements, all at once. Very few meters actually give you all these capabilites. When one does, it’s sometimes just for TV or cable TV. There isn’t any meter out there that will give you the ability to read encrypted signals, such as those coming from DIRECTV Satellite or DISH. Also, most analyzers will work with only one kind of connection. 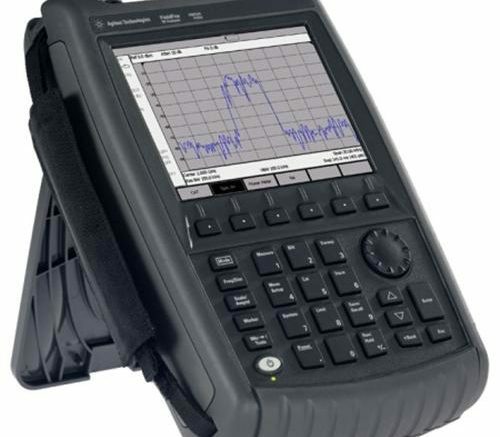 If you’re looking to analyze network signals, TV signals, and industrial cell booster signals, you’ll end up with a stable of meters and analyzers. I generally recommend DIYers get a midrange to high-end meter. Solid Signal has a wide variety of meters for antenna, satellite, and cellular signals that will help you measure exactly what you need. They may still seem a bit pricey for occasional use, but believe me they’ll pay for themselves when you need them.